You Are Here::Home•Buyers•First Time Home Buyers? When you rent a home or condo, your monthly rent payment is gone forever. But when you purchase a home or condo in Benicia, you can deduct your mortgage interest from your federal income taxes, and usually from your state taxes. This will save you money each year, because the interest you pay will be most of your monthly mortgage payment for most of the years of your mortgage. You can also deduct your property taxes you pay as a homeowner. In addition, the value of your home may go up over the years. There are few things more significant than the feeling of home. Buying a new house is an exciting activity, whether it’s your first house or fifth house. Purchasing a home or condo can also be a stressful process if you haven’t done your homework. Fortunately for you, the Moore-Bechelli REALTOR team and Coldwell Banker Solano Pacific has the experience, the knowledge and the wisdom to help you find that perfect home. We can confidently guide you through the process and equip you with the information you need to make informed decisions about the current Benicia real estate market. So take a moment to browse our Benicia Home Buying Service or our home Benicia Home Buying Steps and discover why choosing our experienced REALTOR team is the most sure path to getting the keys in your hand with the least amount of worry. Average Yearly Maintenance – $360/yr. Condo Homeowners Insurance – $30/mo. 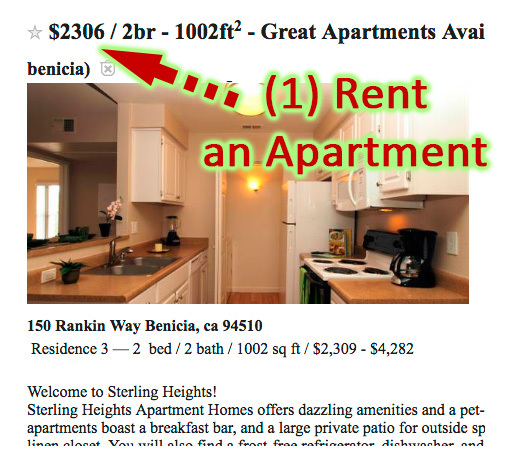 Shown here is a rental from Craigslist (9/1/16) showing a 2 bedroom 1,002 sqft apartment that is for rent at $2,306/mo. If you stay in your home for the next 5 years you’ll be spending about $148,000 (or more if there is a rent increase). The $148,000 covers a roof over your head but once it is spent it is gone forever. The condo for sale in Benicia that is listed at $ 259,500 (9/1/16). This is a 2 bedroom 1 bath unit over 1,000 sqft with upgraded kitchen and bath. Complex has a swimming pool. Rent – Let’s say you rent for 5 years @ $2,330/mo (#3) = $148,332 (#4) in rent payments (calculating some minimum rent increases). Buy – On a $259,500 condo, if you qualify for a FHA 3% down payment program (or $7,785) with a loan value of $251,715 at 3.75% 30 year interest rate your mortgage payment would be $1,167.98 (#1). In addition to the mortgage payment, condo owner would also have additional monthly payments of $758.10 (#2) in pro-rated property tax, condo homeowners insurance, mortgage insurance and the HOA fee. Total mortgage payment estimated at $1,926.08 (#3). Analytics for Renter vs Buyer are as follows in the tables below. Assuming you are in the 25% tax bracket your a mortgage tax savings as shown below would be $15,956.36 (#7). Let’s assume a modest appreciation in value of 3% per year and in 5 years your home is worth $301,411 (#8). Instead of buying a condo (or home), let’s say you invested the down payment, points and closing cost you might have paid to buy a condoat 2.3% = estimate $11,822 investment (#11) your 5 year after tax on the return would be $12,889.64 (#14). Sale Price end of year 5 might be $301,411.06 (#8) less the remaining loan balance of $227,174.83 (#9) less the costs to buy your home and less the costs to sell the home at end of year 5 – approximately $24,092.56 (#10). So the gain on home sale would be $53,144 (#14). Total cost analysis table below shows out of pocket payments to cover the rent payments less any gains or tax savings on the investment. You would have spent $148,332.15 (#15) on rent and have $12,889.64 (#17) in investments had you invested the downpayment and home buying costs. Your total cost over that 5 year period would be $135,442.51 (#18). In the rent scenario, if you did not invest the down payment and buyers costs, your out of pocket would be all of the $148,332.15. Your savings would be $101,867.58. Interest rates are at an all time low. It is a great time to buy a condo (or home) even if you have never purchased a home before. There are lending programs specifically tailored to first time home buyers. The major benefit besides appreciation in owning a home is the ability to write off your interest, property taxes, and homeowners insurance. This will save you money on your taxes. Use our mortgage calculators and do your own analysis. Note: The information provided by these calculators is intended for illustrative purposes only and is not intended to purport actual user-defined parameters. The default figures shown are hypothetical and may not be applicable to your individual situation. Be sure to consult a financial professional prior to relying on the results.